This full day tour combines a driving tour through the city, and visit to the Peterhof Grand Palace and Fountains of it’s Lower Park. You will drive by the main city street – the Nevsky prospect, have several stops at the most picturesque places for a great photoshooting, than visit the birthplace of the city – the Peter-and-Paul Fortress and it’s cathedral, that holds the tombs of the Russian Tsar’s. Peterhof Grand Palace and Park are located to the south from the city. The complex was built by the order of Peter the Great, to be the official summer residence of the Romanov’s family. The picturesque Lower park counts 114 various fountains ans 3 large cascades. 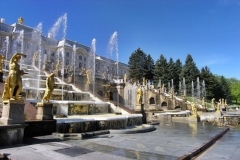 Peterhof is usually compared by it’s beauty and luxury to the Versailes Palace.